• Darren Bundock, Manu Boulogne, Mischa Heemskerk, Yvan Bourgnon, Gurvan Bontemps, Bastiaan Tentij … among the favorites ! 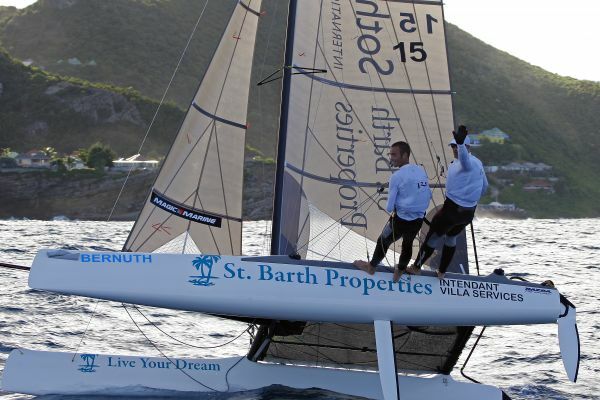 The competitors in the fourth annual Saint Barth Cata Cup have all arrived, as the first day of racing gets closer. On the schedule for Monday, November 14, hard work under the tropical sun in Saint Barth with tool boxes open on the beach in Public. Over 40 boats left France and the United States in mid October. 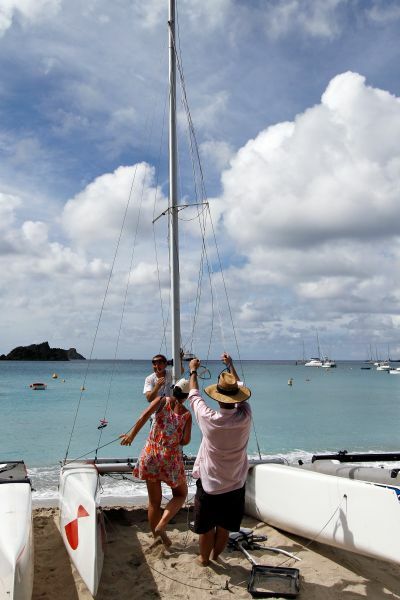 Some of these catamarans, which have traveled around the planet in container ships, have covered thousands of miles. 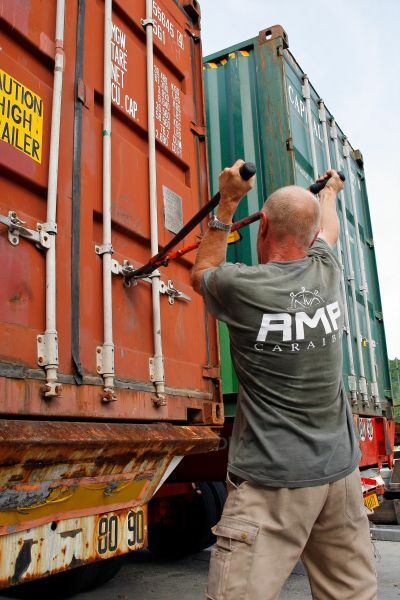 For example, Canadians Anthony Boueilh and Maxime Picard covered more than 1,700 miles from Quebec to Miami, where the five North American boats were loaded for shipping. On the morning of November 14, all of the containers were opened and unloaded; then most of the day was spent assembling the F18 catamarans. A moment of stress could be seen on certain faces, as they were afraid of a pile up, or of not finding all of their material in good condition. After flexing their muscles to get the hulls, beams, and masts out of the containers, the racers began the exercise of precision required by the F18 rules for assembling the boats. 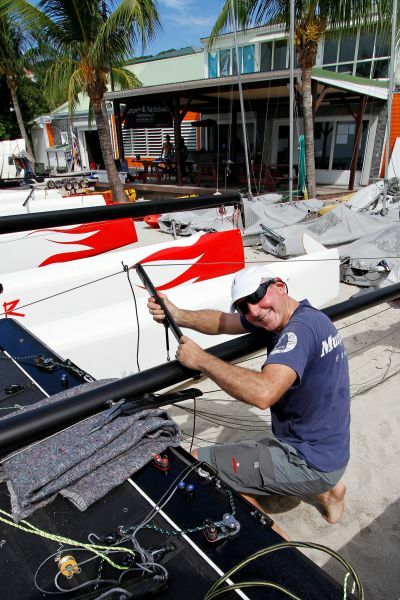 “The unloading and the assembling of the boats is part of the race,” explains Manu Boulogne, 2003 world champion, who is primarily responsible for the Boulogne Conception Marine shipyard. 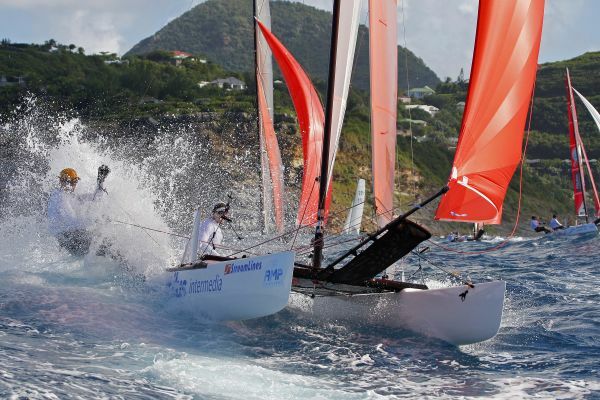 “In a sport like sailing, the unloading is one of the rare moments when all of the competitors unite their efforts. That really counts. That allows us to be together, and brings us closer together. It’s the only time in our discipline when the teams work together on land. At sea, it’s each team for itself!” On November 15, the races finish their adjustments and final preparations and head out to test the local waters. On Wednesday, the 50 teams will take care of registration paperwork before the battle begins on Thursday under weather conditions expected to be ideal. 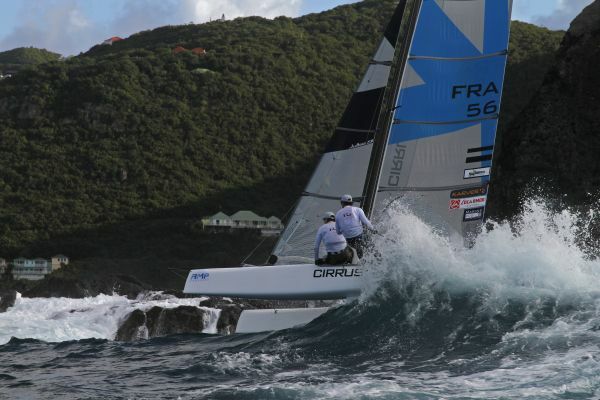 With strict design specifications, the Formula 18 boats are the kings of racing catamarans. 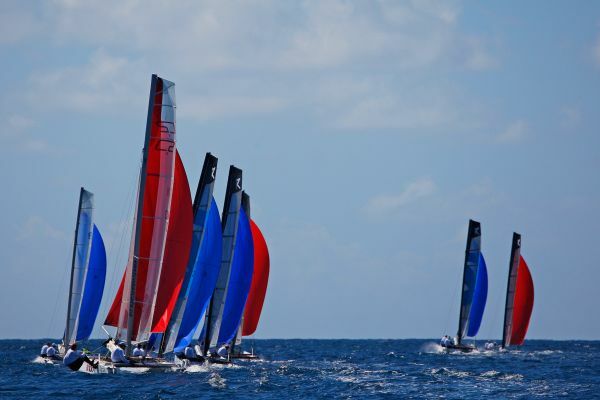 Those who race them are also found on the America’s Cup circuit and important multi-hull sea races. A sport that is high-speed, tactical, technical, and spectacular. Specifications : Length: 5.52 m; Beam: 2.60 m; Sails: 21.15 m²; Mainsail: 17.00 m²; Jib: 4.15 m²; Spinnaker: 21.00 m²; Weight: 180 kg; Price: approximately 20,000 euros. 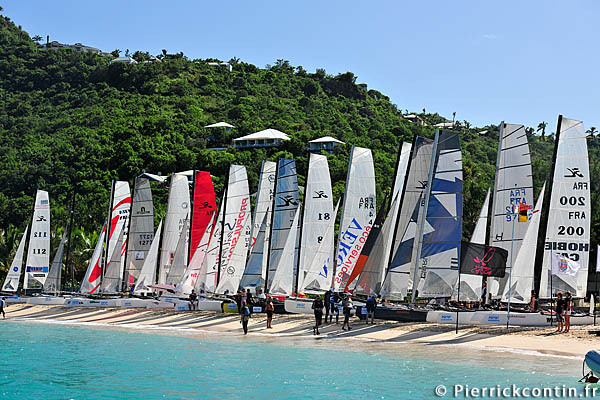 Fast Facts: • Fourth edition of the Saint Barth Cata Cup, November 16-20 • 50 teams set to compete in the Saint Barth Cata Cup • 8 nationalities represented, including the top multi-hull racers • Day one dedicated to unpacking and assembling the boats • Darren Bundock, Manu Boulogne, Mischa Heemskerk, Yvan Bourgnon, Gurvan Bontemps, Bastiaan Tentij … among the favorites ! 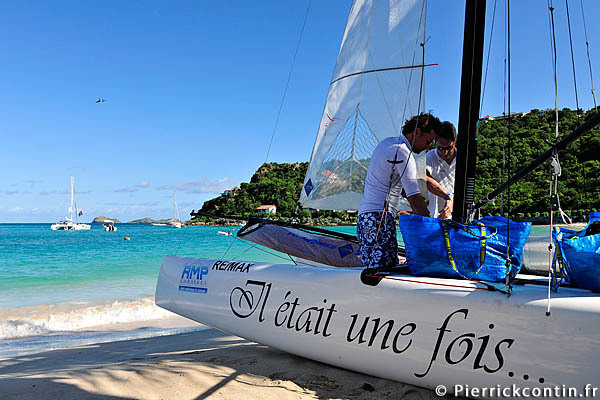 Fast facts: Fourth edition of the Saint Barth Cata Cup,November 16-20, 2011 An exceptional regatta A great mix of champions and passionate sailors 50 teams registered to participate in the 2011 Saint Barth Cata Cup 8 nationalities, and the top multi-hull specialists—Darren Bundock, Manu Boulogne, Mischa Heemskerk, Yvan Bourgnon—all out to win!